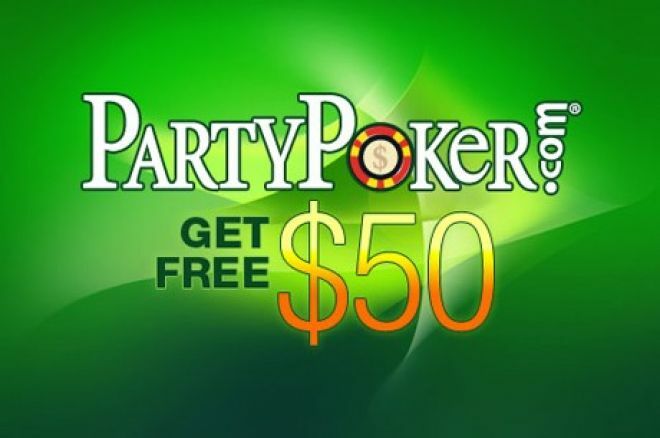 Free $50 Cash Promotion at Party Poker, No Deposit Required! For the past 3 years PokerNews has awarded free cash to thousands of players with our PartyPoker Free $50 Offer. If you've never played at Party Poker, join via our $50 Free Promotional Micro-Site and you'll have free real cash in your new account within a couple days! Create a new PartyPoker account and enter the bonus code "CAFREE50"
Once you have received a confirmation email, $20 will be placed in your PartyPoker account. You must earn at least 40 PartyPoints before you will be able to withdraw the free $20. If you do not earn 40 PartyPoints within 60 days, the initial $20, or whatever remains of it, will be forfeited. PartyPoints are earned at a rate of two PartyPoints per $1 in rake or tournament fees, so earning 40 within 60 days should be a very easy task even for those of you who play at the micro-stakes. Once 40 PartyPoints have been earned, a further $30 will be deposited into your account, bringing the total free cash amount to $50. You must then generate an additional 160 points before you can cash out any of the $30 and must do so within 120 days otherwise the $30, or the remainder of it will be forfeited. Again, meeting the requirements is easy especially as you have almost four months to do so. Q: Why should I sign-up for $50FREE? A: With NO DEPOSIT requirement, you can start your PartyPoker career with a $50 bankroll risk free! Plus, as a member of Club PokerNews you will automatically qualify for all our EXCLUSIVE PartyPoker promotions. Q: I signed up to PartyPoker through another site's promo code? Can I get $50FREE? A: No. This one-of-a-kind free money promotion is only available via the PokerNews Network. If you were unlucky enough to sign up through another site, we still invite you to check out Club PokerNews offers and promotions at our other featured poker rooms.